Posted 7/5/2018 8:50am by Cherry Valley Organics. Cherry tomatoes are among our customers' favorites, which is a good thing because they're also one of our favorite crops to grow! With their prolific production and sweet flavor, there's so much to love about cherry tomatoes. We thought you might enjoy a glimpse into how we grow these tasty tomatoes, why we hand-pick them at the peak of their flavor, and how we make sure they're still farm-fresh by the time they make it to your kitchen counter. Making sure we have the best cherry tomatoes on the block starts by carefully selecting the varieties we grow. Our Crop Manager of Produce, Fruit, and Mushrooms, Tim Gebhart, sifts through our seed sources each winter to select which varieties make the grade here at Cherry Valley Organics. Though we do grow a handful of different selections each season, we also have some standbys that make it into our fields every season. 'Black': This cherry tomato has a unique dark skin and a prolific production. It's an heirloom variety that has an incredibly complex flavor. It's juicy and sweet, with a hint of smokiness. The 1-inch fruits are great for fresh eating and cooking. 'Bing': Farmer Tim's favorite variety for its intense sweetness, 'Bing' is a classic red cherry tomato that's packed with a fruity-sweet flavor with a hint of acidity. The skin is thinner than some other varieties, so the fruits really "pop" when you bite into them. 'Esterina': This canary yellow cherry tomato makes it into our fields for its sweet yet tangy flavor, its incredible production, and its disease resistance. Unlike some other yellow cherry varieties, the skin of 'Esterina' doesn't crack open. That means the fruits are reliably perfect and damage-free. 'Sakura': One of the earliest producing cherries we grow, 'Sakura' is a reliable producer of bright red, yummy tomatoes. The plants are slightly more compact, too, making it easy to fit lots of these beauties in our high tunnel with ease. With a long production period, this cherry tomato produces flavorful and firm tomatoes that ship well but are still juicy and delicious. In addition to carefully selecting each variety, we also plant and cultivate the plants in a specific way. Since we're a USDA Certified Organic farm, we do not use synthetic chemical pesticides, fungicides, or herbicides on any of our crops. 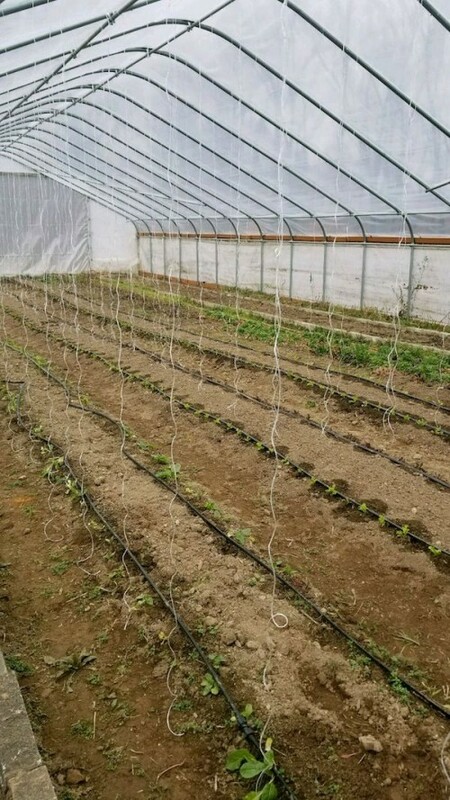 Unlike many other conventional Pittsburgh farms who regularly rely on these products to grow their tomatoes, we get our plants off to a healthy start by amending the soil with compost before planting which helps them fend off diseases naturally. We then give each plant a small scoop of compost monthly once fruit production begins. Newly transplanted tomatoes are also watered in with a dilute solution of liquid fish. These natural fertilizers allow our cherry tomato plants to grow large and healthy, and produce a plethora of full-flavored fruits. Our cherry tomato plants are also carefully staked to ensure the vines are fully supported and the fruits stay off the ground. 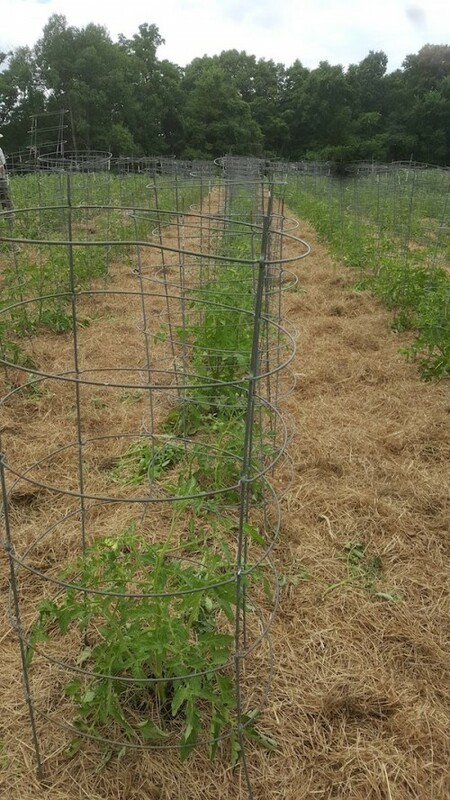 The unique staking system we use also provides the plants with exceptional air circulation, which leads to a reduction in several nasty fungal diseases that tomatoes are particularly prone to. We're growing most of our cherries in the high tunnel where we hang two strings of twine from the roof per plant. Each plant is then pruned to have 2 leader vines. Each leader vine is twisted around the twine as it grows and all of the side suckers are pinched off. This keeps the vines perfectly upright and makes the fruits very easy to harvest. 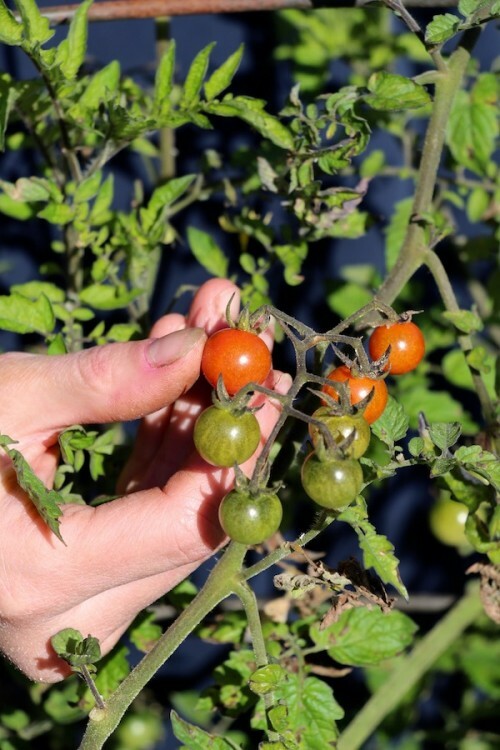 We also grow some of our cherry tomatoes in the field, where the plants are supported by jumbo-size tomato cages. 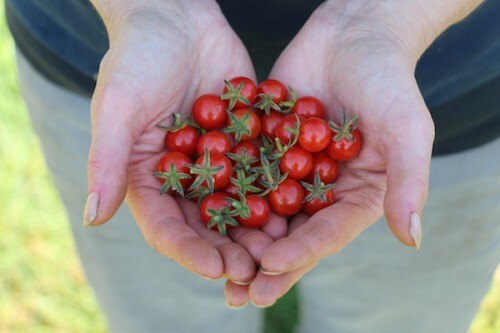 In addition to growing our cherry tomatoes with care, we also harvest them by hand at the peak of their flavor. Unlike some other farms, who pick their tomatoes in a semi-green state and then force them to ripen by exposing them to ethylene gas, ours are always left on the plants to ripen naturally under the warm summer sun. While growing some of the plants in the high tunnel does encourage earlier production, we do not force-ripen our tomatoes in any way. They're left on the plants until they're bursting with sweetness; only then do we harvest them by hand, leaving those that aren't quite ripe enough on the vine to wait for the following harvest. Our cherry tomatoes are sold in mixed pints. We blend all of the varieties we grow together so that our customers can enjoy the full flavor of each separate variety without having to purchase more tomatoes than they can eat. Selling them mixed also means a beautiful blend of colors and sizes, too. We keep our cherry tomatoes plump and juicy (and unsquished!) by never stacking the pint boxes on top of each other. The individual boxes are packed in single layers in crates for the drive to the farmers market to ensure the tomatoes aren't damaged in transit. They're also kept cool, but never refrigerated, which can destroy the sweetness and flavor of tomatoes.